In initially thinking about making a gift bag, I was going to design one from scratch, but then I got smarter. Several bloggers have shown how they use a pre-existing bag to make a template. Bingo. I cut up a small paper bag that I've used over and over again because it is the perfect size to hold lunch or other small things. Then I laid it directly onto canvas and traced the size, adding a half-inch seam allowance on all sides. To the top and bottom I added a 1.5" seam allowance. After some fiddling, measuring and back of the envelope math, I figured out that I could cut up a fat quarter into two pieces measuring 10.75" x 11" to make the exterior. 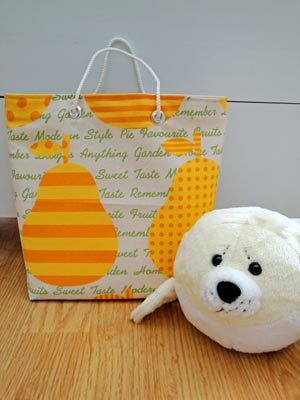 The result is a perfect-sized tote bag to hold lunch or other essentials. And the canvas is nice because it lends some the bag some rigidity. The seal gives a sense of scale. The bag finishes 7" x 8.25" x 3". Long Beach Quilts Festival. More Quilts to Share.